Naissance : 5 octobre 1958, à Amsterdam, Pays-Bas. Total : 203 j. 15 h. 51 min. Temps à bord d'ISS Soyouz TMA-4 8 j. 11 h. 17 min. ISS Expédition 30/31 190 j. 07 h. 46 min. 198 j. 19 h. 03 min. October 5, 1958, Amsterdam, the Netherlands. EDUCATION: In 1977, Andre Kuipers graduated from Van der Waals Lyceum, Amsterdam. Received a Medical Doctor degree from the University of Amsterdam in 1987. FAMILY STATUS: Married, has two daughters. ORGANIZATIONS: Member of the Aerospace Medical Association, the Dutch Aviation Medicine Society and the Dutch Association for Spaceflight. HOBBY: Flying, scuba diving, skiing, hiking, travelling and history. During his medical studies, Andre Kuipers worked in the Vestibular Department of the Academic Medical Centre in Amsterdam, the Netherlands, where he was involved in research of human equilibrium system. In 1987-1988, as an officer of the Royal Netherlands Air Force Medical Corps, he studied accidents and near-accidents caused by spatial disorientation of pilots. In 1989 and 1990, he worked for the Research and Development Department of the Netherlands Aerospace Medical Centre in Soesterberg. He was involved in research of the astronauts adaptation in space, contact lenses for pilots, vestibular apparatus, blood pressure and cerebral blood flow. In addition, he performed medical examinations of pilots and medical monitoring of human centrifuge training, and also gave lessons to pilots in psychological aspects of flying. Since 1991, Kuipers has been involved in preparation, coordination, baseline data collection and ground control of psychological experiments developed by the European Space Agency. In particular, he was a Project Scientist for a human physiology facility that flew on the D-2 Spacelab mission in 1993 and for two payloads for lung and bone physiology, that flew aboard the Mir Space Station during the six-month Euromir-95 mission. He was involved in the development of the Torque Velocity Dynamometer (TVD) that flew on the LMS Spacelab mission in 1996, the Muscle Atrophy Research and Exercise System (MARES), a special device used in muscle research onboard the Space Station, and an electronic muscle stimulator (PEMS). Andre Kuipers provided support for the life science experiments during the ESA parabolic flight campaigns which are performed twice a year. He participated in these flights as an experiment operator, technician, test subject and flight surgeon. In July 1999, Andre Kuipers joined the European Astronaut Corps of the European Space Agency, whose homebase is at the European Astronaut Centre (EAC) in Cologue, Germany. Concurrently with his training he was assigned to the European Space Research and Technology Centre (ESTEC), Noordwijk, the Netherlands, continuing his hormer work for the Microgravity Payloads Division within the Directorate of Human Spaceflight. Until the start of preparations for his flight, Andre Kuipers supported an active research programme in the field of psychological adaptation of humans to weightlessness, coordinated the European experiments on lung function and blood pressure regulation, which will be performed using ESA's specially developed apparatus, the Advanced Respiratory Monitoring System (ARMS). 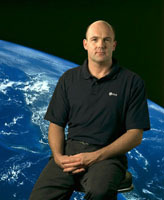 In 2002, Andre Kuipers completed ESA's Basic Training Programme which is performed at the European Astronaut Centre (EAC) in Cologne, Germany and Yu.A. Gagarin Cosmonaut Training Centre, Star City, Russia. From October 30 to November 10, 2002 as 'Cap Com' during implementation of the Odissea Project onboard the ISS by the Belgian ESA astronaut Frank De Winne (VC-4), Andre supported ESA's ground team at the Russian Mission Control Centre. He was in training for a spaceflight as a flight engineer within a backup crew (VC-5). In December 2002 he was assigned as a Flight Engineer of the Soyuz TMA spacecraft for a flight to the International Space Station (ISS) within the visiting crew (VC-6) in April 2004. AWARDS: Officer of the Order of Orange-Nassau. During his medical studies, Andre' Kuipers worked in the Vestibular Department of the Academic Medical Center in Amsterdam, the Netherlands, where he was involved in research of human equilibrium system. In 1987-1988, as an officer of the Royal Netherlands Air Force Medical Corps, he studied accidents and incidents caused by spatial disorientation of pilots. In 1989-1990, he worked for the Research and Development Department of the Netherlands Aerospace Medical Center in Soesterberg. He was involved in research of the astronauts adaptation in space, contact lenses for pilots, vestibular apparatus, blood pressure and cerebral blood flow. In addition, he performed medical examinations of pilots and medical monitoring of human centrifuge training, and also gave lessons to pilots in psychological aspects of flying. Since 1991, Kuipers has been involved in preparation, coordination, baseline data collection and ground control of psychological experiments developed by the European Space Agency. In particular, he was a Project Scientist for a human physiology facility that flew on the D2 Spacelab mission in 1993, and for two payloads, for lung and bone physiology, that flew aboard the Mir Space Station during the six-month Euromir-95 mission. He was involved in the development of the Torque Velocity Dynamometer (TVD) that flew on the LMS Spacelab mission in 1996, the Muscle Atrophy Research and Exercise System (MARES), a special device used in muscle research onboard the Space Station, and an electronic muscle stimulator (PEMS). Andre Kuipers provided support to the life science experiments during the ESA parabolic flight campaigns which are performed twice a year. He participated in these flights as an experiment operator, technician, test subject and flight surgeon. 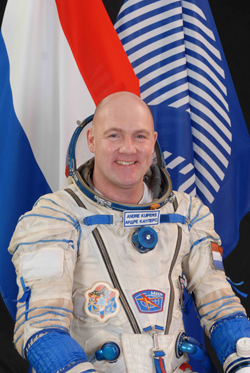 In July 1999, Andre Kuipers joined the European Astronaut Corps of the European Space Agency, whose homebase is at the European Astronaut Center (ÅÀÑ) in Cologne, Germany. Concurrently with his training he was assigned to the European Space Research and Technology Center (ESTEC), Noordwijk, the Netherlands, continuing his former work for the Microgravity Payloads Division within the Directorate of Human Spaceflight. Until the start of preparations for his flight to the ISS, Andre Kuipers supported an active research program in the field of psychological adaptation of humans to weightlessness, coordinated the European experiments on lung function and blood pressure regulation, which will be performed using ESA's specially developed apparatus, the Advanced Respiratory Monitoring System (ARMS). 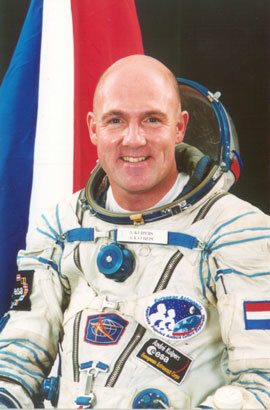 In 2002, Andre Kuipers completed ESA's Basic Training Program which was performed at the European Astronaut Center (ÅÀÑ) in Cologne, Germany, and Yu.A. Gagarin Cosmonaut Training Center, Star City, Russia. From October 30 to November 10, 2002 as 'Cap Com' during implementation of the Odissea Project onboard the ISS by Belgian ESA astronaut Frank De Winne (VC-4), Andre Kuipers supported ESA's ground team at the Russian Mission Control Center. He passed training for a spaceflight as a flight engineer within the Expedition a backup crew (VC-5). In December 2002 he was assigned as a Flight Engineer of the Soyuz ÒÌÀ spacecraft for a flight to the International Space Station (ISS) within the visiting crew (VC-6) in April 2004. In July 2003 he was assigned as a Flight Engineer for the prime crew of the Soyuz ÒÌÀ-4 spacecraft. He performed his first spaceflight on April 19 - 30, 2004 onboard the Soyuz ÒÌÀ-4 spacecraft, together with Gennady Padalka (commander) and Michael Fincke (flight engineer-2) within the crew of Expedition 9 to the ISS. Since April 21 he worked onboard the ISS under the European program. Andre Kuipers landed in the Soyuz ÒÌÀ-3 spacecraft, together with the crew of Expedition 8, namely A. Kaleri and Michael Foale. The flight duration was 10 days 20 hours 48 min 46 s.
At a period of January 16 - 27, 2007 he participated in the training for survival within the preliminary crew, together with Oleg Kononenko (Russia) and Robert Thirsk (Canada), in the forest 30 km from Moscow. In August 2007 he was preliminarily assigned to the backup crew of Expedition 20 to the ISS (ISS-20). On February 12, 2008 NASA officially declared on his assignment to the backup crew. On June 22 - 28, 2008 in Sevastopol, the Ukraine he participated in the training within the preliminary crew, together with Maxim Ponomarenko (Russia) and Chris Hadfield (Canada) in case of the descent vehicle water landing.